I am dubbing this “the cake of summer” with it’s toasty outsides and chocolate graham crackery insides. It’s such a classic combo and in this cake, the messy, campy, summery dessert we think of as “smores” gets all dressed up and really puts on a show. 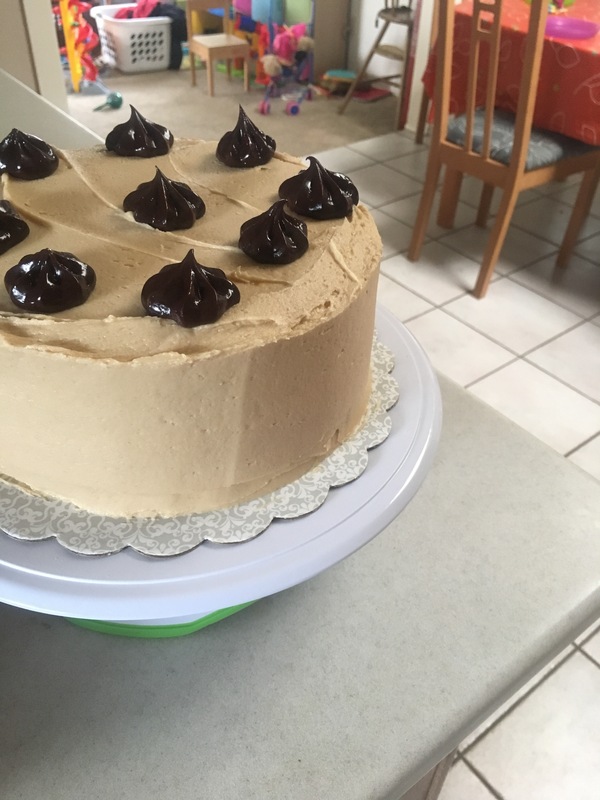 I made this for my now 3 year old’s first birthday and people went nuts for it, but I wanted the cake itself to have more flavor and I also felt that using a darker more fancy chocolate for the ganache filling would create more of a flavor sensation. I decided to make it for my Summer themed dinner party last weekend and I adjusted accordingly resulting in knockout flavor and jaw dropping beauty in it’s presentation. 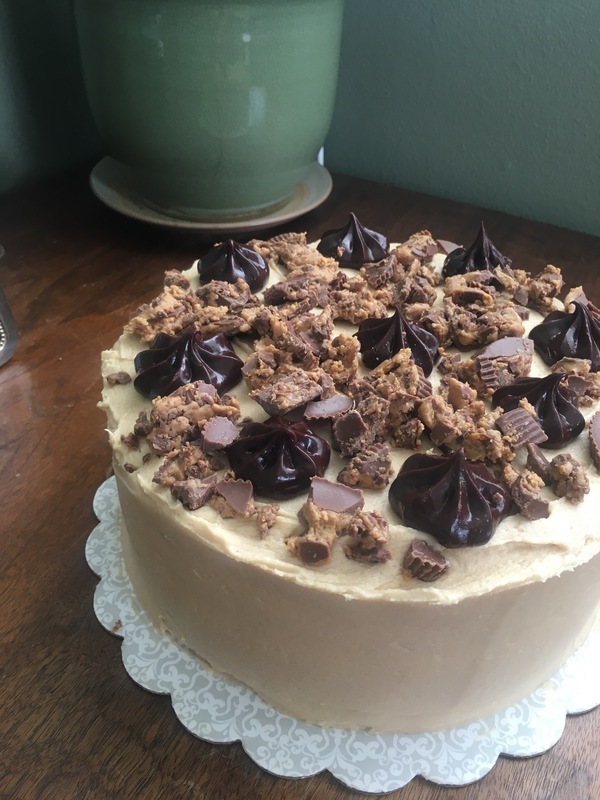 Original recipe is linked below, but I had a few people who tried both versions and were absolutely blown away by my more flavorful smores cake v2.0. First make the cake. Preheat oven to 350. Spray or butter two 9 inch round cake pans (this cake is high volume, so if you have 9 1/2 it might work a little better, but 9 inch works, just keep an eye or put them on a cookie sheet to avoid spills). Line your cake pans with circles of parchment paper, with most cakes, you can skip this step, but this is a moist and sticky cake and lining with parchment makes a big difference in how they come out so please do this. Coat parchment and pan with more cooking spray. In a medium bowl, whisk together flour, cracker and cookie crumbs, baking powder, baking soda, salt, and spices. Set aside. In a large mixing bowl cream butter and sugars together until light and fluffy. Add eggs one at a time, scraping the bowl down after each addition. Add a third of the dry ingredients, then half the buttermilk, a third of the dry ingredients, the remaining buttermilk, and then the remaining dry ingredients, mixing between additions until combined. Scrape down the bowl, and mix again briefly if needed. Divide the batter evenly between the prepared cake pans, smoothing tops. Bake until a toothpick inserted into the center comes out clean, about 30-35 minutes. Cool in pan on rack, then run a knife between the cake edges and pans before turning out onto a rack to cool. Let cool completely, a process you can speed up in the fridge. To make the filling, place the chocolate in a heatproof bowl. Combine the heavy cream and salt in a small saucepan, and bring to a simmer. Pour over the chocolate, and let sit for 1 minute, then whisk until smooth. Set bowl over another bowl filled with ice water, and stir it until it firms up to a spreadable consistency. You can let it cool down in the fridge, but it works best if you stir it every now and then so it cools evenly. To prepare the cake arrange a single layer on a serving platter, cake stand or cake board. For a neat looking cake, use a long serrated knife to level the top gently – they don’t puff up super big as some cakes do so it won’t be a lot, and you will find plenty of people willing to eat your cake scraps. Spread the chocolate thickly over the bottom layer. Place top layer over it and level this one too if you would like. To make the frosting place the egg whites, granulated sugar and cream of tartar in the heatproof bowl of an electric mixer. Set over a saucepan of simmering water. Whisk constantly until sugar is dissolved and whites are warm to the touch – about 3-5 minutes. Transfer the bowl to an electric mixer fitted with the whisk attachment. Beat starting at a low speed, gradually increasing to the high, until stiff, glossy peaks form, 4-7 minutes. Add vanilla and mix until combined. You will want to use this frosting right away, it won’t keep well. Spread a thin layer of the frosting over the top and sides of the cake covering all the crumbs. Transfer cake to the fridge for 5-10 minutes to let it set. Next generously coat the top and sides with additional frosting making a pretty pattern. You could even pipe on big pretty peaks, but I just made it look artistic and delicious. Remove any flammable objects and people from the cake area and with a kitchen torch on a low setting, lightly brown the outside of your cake creating a toasted marshmallow effect. If you haven’t met Oatmeal Coconut Pecan Cake, let me introduce you to one of the great loves of my life. Trust me, this one is for the record books people. I’ve never served it without loud praise, wide applause, and urgent requests for the recipe. My husband, who isn’t really a cake guy, calls this his favorite and it’s the only cake he actually requests on the regular. There is so much that’s right about this cake, the always moist and magical oatmeal texture, the not-to-sweet with brown sugar cinnamon flavor, and the coconut pecan topping just sends it into the prize winning cake hall of fame (that’s a thing, or at least I should make that a thing). It’s one of those rare combinations of show stopping deliciousness that’s embarrassingly easy to make. Try it and see! Set oven to 350. Prepare a bundt pan by either spraying with baking spray that has flour or greasing well and tapping in flour to coat. In a large bowl combine melted butter, oatmeal, and boiling water. Let sit for 20 minutes. Add sugars then eggs, one at a time mixing well after each. Add flour and before mixing just put the baking soda, salt, and cinnamon on top of the flour heap then mix it all together adding vanilla last. Bake for 25-30 minutes until set and a toothpick comes out clean. Let cool in pan 10 minutes before turning out onto a dish that can go in the oven. If you don’t have one put it on a cookie sheet for the application of the topping then transfer to a plate once it’s completed. For the topping put the sugar, cream and butter in a saucepan over medium heat. When sugar is dissolved and mixture starts bubbling on the sides mix in coconut and pecans then remove from the heat. It will stick on the cake a bit better if you let it cool 10-15 minutes before spreading on the cake. Once your topping is on put cake under the broiler (I keep it on low) for only a minute or so, just long enough to brown the topping. Serve anytime, keeps at room temp for a number of days.